The 81st Ukrainian Chess Championship took place from 26th July to 7th August in the President Hotel in Kiev. Twelve players competed in the round robin tournament. Practically all the top national players, with exception of Vassily Ivanchuk, participated. Top seeded was the defending champion Ruslan Ponomariov. 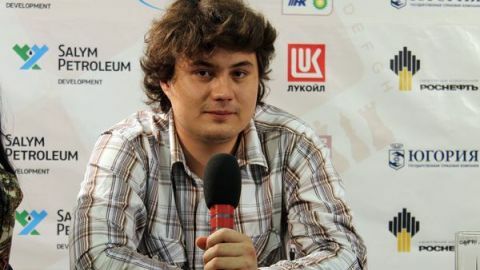 However, GM Anton Korobov, seeded in the lower half of the starting list, convincingly won the Championship with 8 points (5 wins, 6 draws), leaving the nearest followers a full point behind. GM Andrei Volokitin, who finished on shared 2nd place, was leading in the middle stage of the tournament but a pair of defeats deprived him from claiming the title. With the average elo of 2666 this was the strongest Championship ever in the history of independent Ukraine.